The Walking Dead: A New Frontier is the third season of Telltale Game's epic retelling of The Walking Dead saga in video game format, and the latest season deviated further from the canonical lore of the TV show and the graphic novel. This series of chapters introduced players to Javier and his brother, David, plus his brother's family and children. 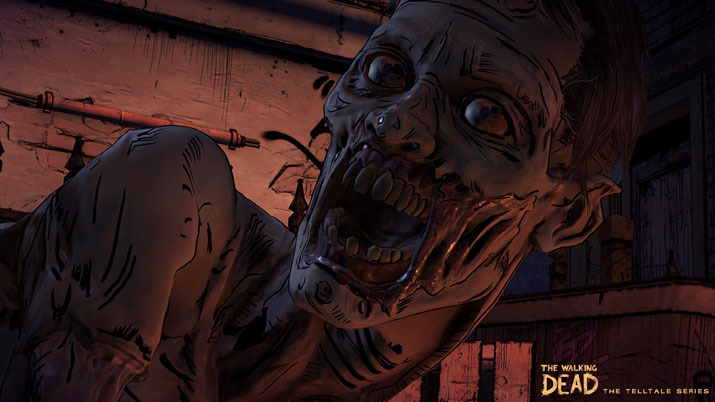 Clementine, the protagonist from Season 2, also returned as a compelling secondary character whose personality and influence is felt throughout the entire third piece of this tale. But does A New Frontier – Episode 5 achieve a satisfying ending, one worthy of The Walking Dead's legacy? Telltale Games continues to deliver on phenomenal storytelling, arguably to the point of working to redefine the genre and challenge how immersive and compelling video games can be. The characters in A New Frontier are, for the most part, multi-dimensional, with varied objectives and personal preferences. From the very beginning of Episode One, The Walking Dead: A New Frontier has established yet another new angle in the Walker-ravaged world. “Muertos,” as the characters refer to the undead in A New Frontier, remain a constant, looming threat; however, the fractured society and the personalities encountered in these stories play an even larger role in defining the experience. Episodes 1-4 depicted the battle for dominance between the community and faction known as the New Frontier, and their ongoing struggle to be in the position of power – and the most security – in Virginia. New Richmond begins as a haven with promise, but their leadership is woefully flawed. Joan, a dictator in her own right, has been making decisions for her cluster of survivors that come at a high price. Javi's brother, David, had become an influential member of New Richmond's society, but his underlining cruelty and dominance issues undermined his ability to contribute to the whole of their community. Throughout Season 3, David's wife, Kate, is a kind-hearted, compassionate person in the mix. It's no surprise that New Richmond and the plight of its population – especially given the role that she, Javier, and the other main characters play in its fate – makes her feel compelled to help them recover their losses. Clementine continues to be focused on discovering the fate of AJ, an infant from her past that we learned about during previous episodes. I certainly enjoyed the variety of back stories, personal motivations, and attributes we can find in the cast. In the first two episodes, the Steam community spoke out about the minimal amount of influence that the port of previously saved games had on the events of A New Frontier, so I can only hope that the next season to feature Clementine will be more influenced by my Season Three decisions. Otherwise, I found the ending to be a bit lackluster. It felt a little gimmicky – like the writers were desperate to drive home the horror and sadness of The Walking Dead world, but after a hit TV show, graphic novels, and two previous seasons of these interactive storytelling titles, I can't help feeling like it was overkill. The franchise doesn't hesitate to tug at heartstrings, or even outright break the heart of its fans, with savage deaths and missing characters, but at times, the balance in A New Frontier feels skewed. At least with my dialog choices, David was a classic angry villain and overly-aggressive soldier; Kate was obviously designed to be a romance option for Javi. Gabe was practically a caricature of the whiny, spoiled teenager. Clementine stood out as the cast member that continued to be consistently entertaining, though Javier grew on me as I progressed through the episodes. Looking back at A New Frontier as one whole, complete story, this Telltale Games release is worth picking up, overall. Episode 5 wasn't weak enough to make me hesitant to recommend this chapter in The Walking Dead's ongoing franchise, but the episodes this season do seem to be considerably shorter than those in previous installments. While this finale is lackluster compared to the previous four episodes, A New Frontier is still yet another example of Telltale Games' affinity for immersive storytelling, and it left me eager for the next installment of the saga in season four.